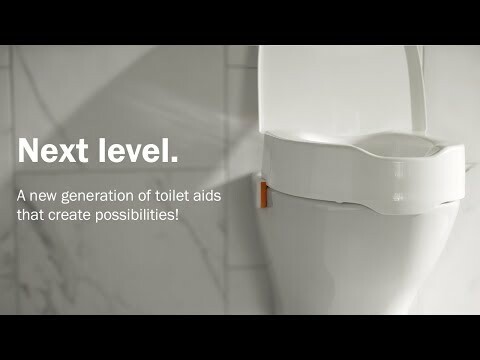 Etac My-Loo is part of a new generation of toilet aids from Etac that we call "Next Level". With smart design and excellent ergonomics it offers extra comfort and accessibility. My-Loo with brackets, is designed with few parts made of durable materials. The clean, smooth surfaces are easy to clean with a soft cloth. Should separate cleaning be required, the seat is easy to remove and equally simple to put back in place. Thanks to the flexible and adjustable brackets My-Loo fits most toilets and is extremely easy to install. Attach the brackets, place the seat on the toilet, press both brackets- Click and the installation is done! The soft shape of the seat gives safe support and high comfort. An extra large opening and generous recesses facilitate acessibility during personal hygiene. The clean, smooth surfaces are easy to clean with a soft cloth. Should separate cleaning be required, the seat is easy to remove and equally simple to put back in place. The easily attached brackets with wide adjustability and large friction surfaces make My-Loo at all times safely fixed to, and easily mounted on, any toilet porcelain. Entirely without screws. My-Loo raised toilet seat, with brackets, is available in two different heights, 6 and 10 cm, with or without lid. Clean / disinfect the product using a standard non-abrasive cleaning agent with a pH between 5 and 9, or with a 70% disinfectant solution. The product can be safely cleaned in a cabinet washer-disinfector at 85°C for 3 minutes. Secure, safe and simple for both users and carers.